Get the Best Investment Strategy of 2018 by Our Expert Financial Analysts! Want to invest in mutual funds but don’t know which schemes to buy? Here are 5 ideal portfolio types to suit your investment goals. ‘Mutual Fund Sahi to Hai,’ but I am still confused which schemes to buy? Why doesn’t anyone just suggest the most viable option? Aren’t there any ready-made portfolios that suit my profile? 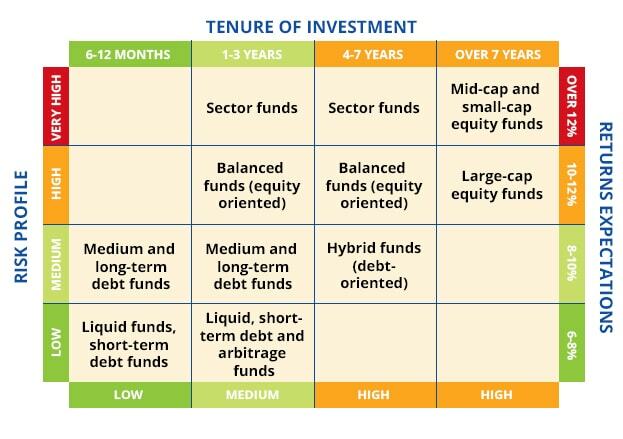 Is there anyone in the financial space who can tailor the best allocation of the funds in a portfolio and present it on the behalf of all the mutual fund companies? Ahhhh! It’s getting on your nerve, isn’t it? We understand how tedious it is. We know that, the commoners are aware of the significance of growing their money through various investment options but they somewhere lack the management. Moreover, with the evolving technology, investors generally want to follow the ready-to-move approaches. Hence keeping the convenience and priorities in mind, we have custom-made these five types of mutual fund portfolio allocations. All of them cover almost the entire investor space, ranging from the conservatives who want reasonable growth with minimal risk to the aggressive ones who are willing to face the volatility. There is a portfolio for retirees even, who are looking to beat inflation from the returns and gain regular income from the investments. What Type of Portfolio Will Suit You? Our recommendations of portfolio are based on the three factors- Risk Appetite, Investment Horizon, and Investment Objective. All these 3 factors must be verified by the readers before they make a choice out of the list. All the above factors are crucial in determining the way of asset allocation and type of funds that will suit your profile. For instance, if you can keep patience towards the market volatility and are willing to invest for 8-10 years, go for the aggressive portfolio that invests more than 85% in equity funds. The small and mid-cap orientation of the portfolio makes it risky as well as spectacularly rewarding at times. On the other hand, if the thought of losing your money gives you nightmares, stick to the defensive portfolio that allocates 20-25% of its corpus in equity funds. Most of it is invested in the debt funds which minimize the risk and stabilizes the returns. ‘Slow and steady wins the race.’ Not sure about slow but steady investment certainly wins the rewards in the mutual funds. SIP does not eliminate the risk at all but just reduces it. Other than SIP you can invest through lump-sum also. But the portfolios suggested below are suitable for the SIP. Without going deeper, let us have a look at the five models of the portfolios that are being suggested by our experts. The suggestions are the result of an intense analysis of the relativity between the various investor profiles and aptness of the funds in the portfolios. A speculative portfolio is something what you call a pure gamble. This portfolio presents more risk than any others discussed in this write up. Speculative strategizes to get benefits out of the mix of flourishing as well as emerging sectors. Technology or health care firms in the process of researching a breakthrough product, or an established oil company trying to beat its own historical figures would fall into this category. Speculation may be the one portfolio that requires the most homework to ensure success. Although, betting your money in this style can generate jaw dropping profits in short amount of time. 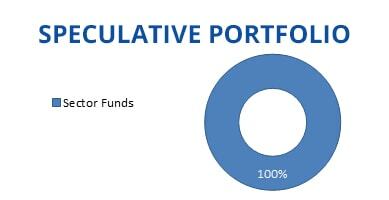 But finance gurus suggest a maximum of 10% of one's investable assets to be allocated in a speculative portfolio. This portfolio is suggested to only the ones who can run the risk of their money because speculative stocks are typically trades and not the classic buy-and-hold investment. 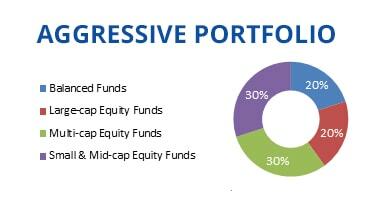 Aggressive portfolio is predominantly an equity oriented fund portfolio that targets to capture the growth of equities but with higher risk. The allocation of the portfolio generally has a spread of more than 80% across the small-cap, mid-cap, and large-cap equity funds. Debt fund exposure of this strategy is around 20% which captures relatively less opportunities in debt space. Aggressive portfolios are known for producing more than 30% returns historically, if not this much, one can at least expect an average return of over 12% -15%. The investors of aggressive style are recommended to stay invested for a long-term of over 5-10 years. This type of portfolio is greatly affected by the market volatility; hence, the risk involved is also high. We advise this investment style to those who are passionate about aggressive growth in their wealth but can tolerate high risk equally. 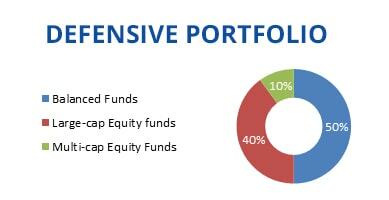 As the name suggests, the balanced portfolio has a balanced profile with a 40% to debt funds and 60% exposure to equity funds (25% large-cap funds, 25% multi-cap and 10% small & mid-cap funds). The exposure to equity funds provides moderate growth with moderate risk by enhancing the risk return profile of the overall portfolio. This portfolio can be an apt match for an investor with a moderately high-risk tolerance and investment horizon longer than 5 years. This strategy is acceptable when you are willing to accept the times when market goes moderately volatile. In exchange, this portfolio increases the possibility of receiving returns that could outpace the inflation by a significant margin. Defensive portfolio is designed for the investors who are scared of losing their money in stocks. This investment style can be an ideal option for the ones who just can’t risk their sum to earn returns. The investors who trust this strategy should know that least 90% of their investment amount is allocated to the balanced and large-cap funds to control their risk prospects. A defensive investment strategy requires regular portfolio rebalancing to maintain your asset allocation. This activity will protect your portfolio against the significant losses during major market corrections. As you have chosen for limited risk, your expected rewards will lie somewhere between 8-10%. This type of portfolio is recommended to the ones who want to invest for short-term as they hesitate to face the market volatility. A defensive portfolio is prudent for most investors. Income portfolio is for the ones looking for a steady and reliable monthly income from their investments. 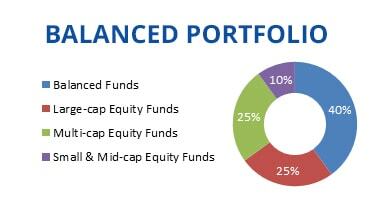 Income portfolio comprises mainly of debt-oriented balanced funds. It is riveting to note that a monthly sum is withdrawn by the investor as they invest in an income portfolio. 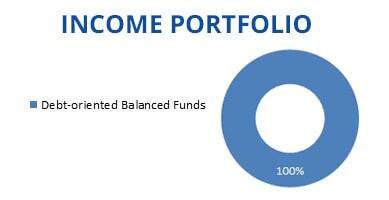 The monthly income which we are talking of is generated by the dividends that are distributed by the funds of the portfolio. As the portfolio focuses mainly on the debt-oriented it yields better returns as compared to the fixed deposit peers and the risk involved is minimal. This type of portfolio is broadly suits the ones who are reaching their retirement or are already retired. We believe that tax-saving is an integral part of the financial planning. And as far as mutual funds are concerned, ELSS is the best way to save tax through mutual fund investment. The 3-year lock-in period of ELSS tends to benefit the investors even during the high volatility of the market. Thus, we would advise all the investors to involve an ELSS fund to their pack. At the end of the day, it is You – the investor who has to decide on the right allocation across all the five model portfolios recommended above. It might seem easy but building an investment portfolio does entail more effort. You will be required to monitor your portfolio(s) and rebalance them more frequently. Too little or too much exposure to any portfolio type can bring in additional risks. Defining and building a portfolio increases your investing confidence, and gives you control over your finances. MySIPonline has always tried helping the readers to make the best choice that tends to become worth cherishing over the time. Happy investing!